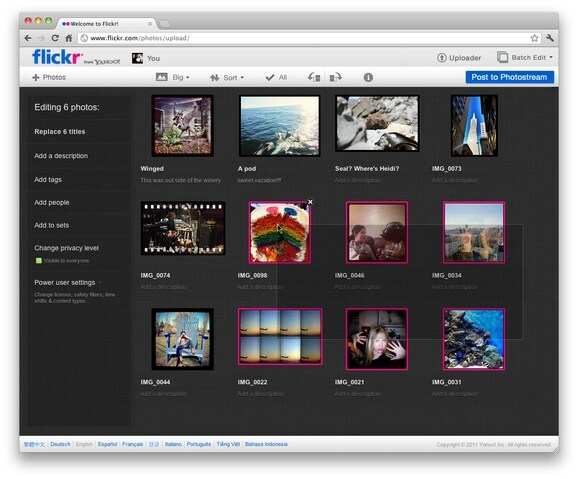 Yahoo’s management of Flickr has been something of a mystery. The photo-hosting service, once far and away the frontrunner and choice of pros and casual shooters alike, has seen few improvements in recent years — an eternity in the fast-moving online photography space. Many (including myself) cling to the service out of a kind of inertia, but it’s hard not to be jealous of the whiz-bang layouts and features of newer sites and services like 500px and Instagram. Even communities like Google+ and Pinterest are making Flickr users second-guess themselves. It looks as though Flickr is finally getting the makeover it has deserved for years, though: launching on the 28th is a whole new layout and upload style, with an emphasis on community and consumption. The news comes straight from Flickr’s head product manager, Markus Spiering, who told BetaBeat all about it in an interview. He explained that communication wasn’t as good as it could have been over the last few years, but insisted that Yahoo has its heart in the right place. But few would disagree that the site has remained mostly the same in a changing industry, and Yahoo has let new sites eat Flickr’s lunch for quite a while now. At any rate, some serious changes are forthcoming: the photo browsing page is far more browsable, with a dynamic layout that minimizes white space and looks suspiciously friendly to touch interfaces. A new upload page is in the works as well, something that’s long overdue. I’ll miss the small pleasure of the way the check marks pop into the progress bars, but the new drag-and-drop interface, with richer interaction with the photos uploaded (more like the organization page) and a more robust workflow. It’s a serious UI change, but if it’s the only thing coming in 2012, it still might not be enough to satisfy the wolves at the door. Their presence in tablets and mobile needs to be boosted, and the site needs to decide who it’s competing with or else it will, by default, be competing with every comer. Spiering seems optimistic, but of course, that’s part of his job.